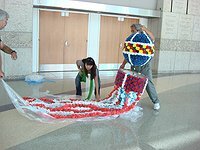 In making this decoration we had to use many smaller versions of the paper flowers to get the details down correctly. 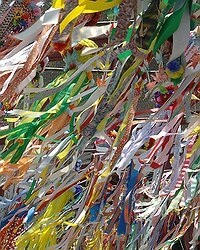 In addition to the colorful streamers, this kazari had dozens of cranes made by volunteers trailing in the wind. 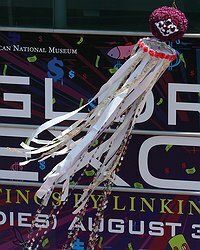 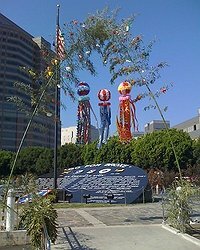 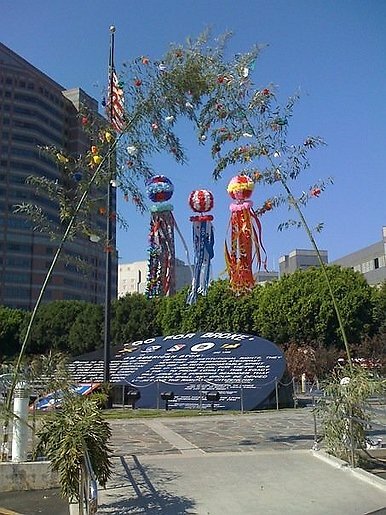 These fukinagashi (streamers) are one variant for the Tanabata kazari displayed for the First Annual Tanabata Festival held in Little Tokyo August 14-17, 2009. 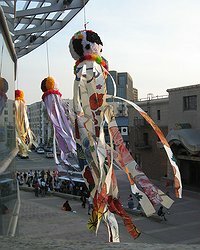 240 of these kazari were hung outside the Museum of Contemporary Art from August 14-17, 2009 for the First Annual Tanabata Festival. 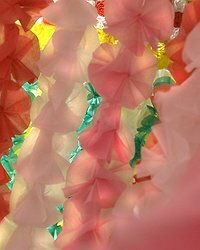 Flowing in a sea of streamers these colorful decorations caught the eye of many. 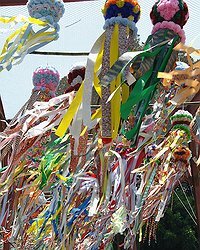 Colorful streamers, dozens of flowers, a refreshing sight as each cool breeze catches the decorations hanging for the First Annual Tanabata Festival. 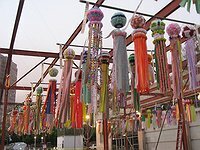 ylkawashima — Last modified Jan 12 2017 6:31 p.m.